← Female Empowerment with Skateboards! 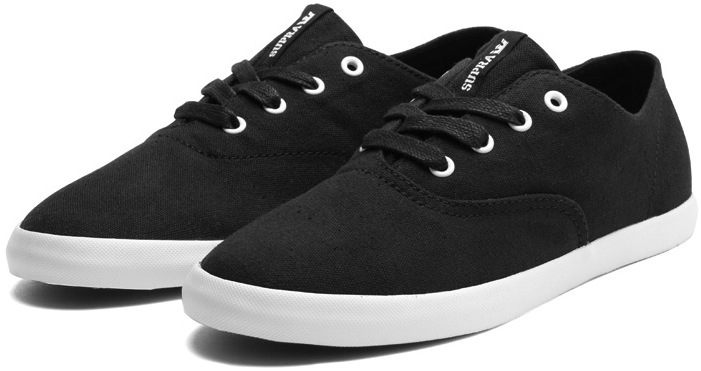 Supra Wrap is a low profile silhouette skate shoe. A little change from the past weeks posts. This shoe is a vulcanized two piece canvas construction. Thin collar, thin tongue and single layer of foxing tape. Why do you just skate barefoot? Thats crazy. Anyhow check em out. More Vegan colorways then you can shake a stick at. 13 Total! Sizes, 4-14. $49.00 or $60.00 for the Waxed Twill. And the sole match the canvas upper! This blog is so sick, I’ve been trying to find vegan skate shoes for awhile, something besides some Van Eras. I am a vegan , and I love to skateboard whoever started or runs this blog has to be the sickest person ever, thank you !